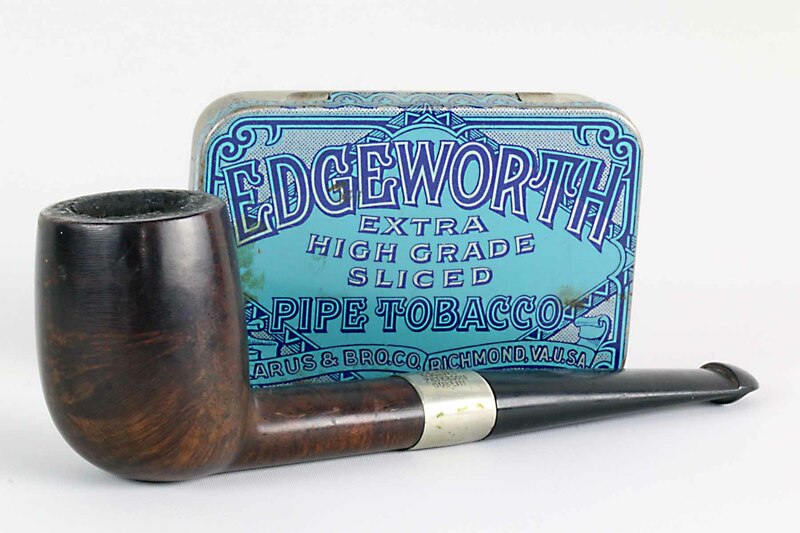 James Arrington, who entrusted me with his Late Patent-Era House pipe, also sent me a vintage billiard to restore that I think you’ll find interesting. It’s one of those shapes that deserve to be reintroduced to the catalog, for one thing—an oval-shank that can be set on a flat surface. One of the great things that characterizes Peterson as a marque is its emphasis on practicality. Over the years the company has released a number of “setters” or flat-bottomed pipes, both bents and straights. There aren’t any oval-shanked straights in the current production catalog, although the classic dublin 120F (“F” in this case for flat) was in the catalog as late as 1965. And then there’s this amazingly dynamic, forward-canted oval-shank billiard. 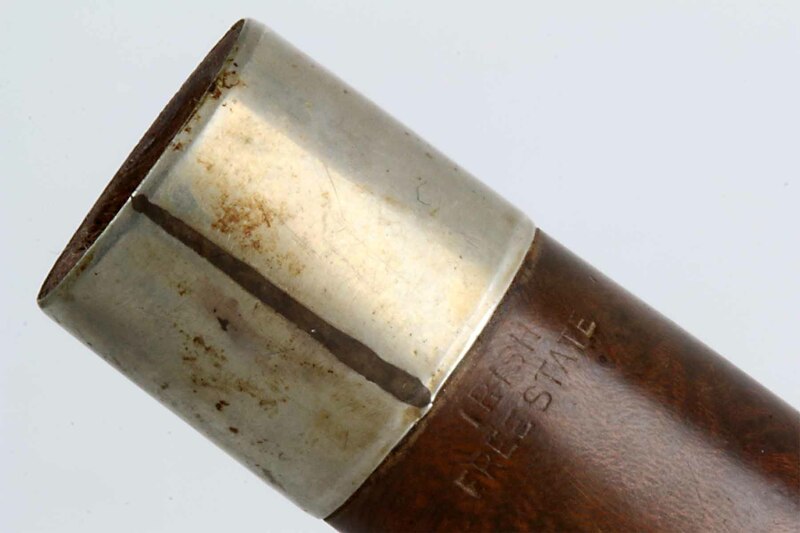 The pipe is stamped with number 949 on the reverse, IRISH over FREE STATE on the bottom of the shank at the mortise, and fork-tail “Peterson’s” over Dublin3 on the top of the shank. The 900-shape group is first glimpsed in a Viennese distributor’s Peterson chart from the mid-1920s and was firmly ensconced by the 1937 catalog, where it is presented in the “K” and “1st Quality” lines as the 949 and in the Kapet and De Luxe lines as the 260. The same shape (as sometimes happens with Peterson) is double-described. Twenty-one shapes from the 900 group are found in the 1937 catalog, but by the 1945 catalog this numbering system had disappeared, with the shapes formerly double-described moving into the Classic Range numbers still in use today. 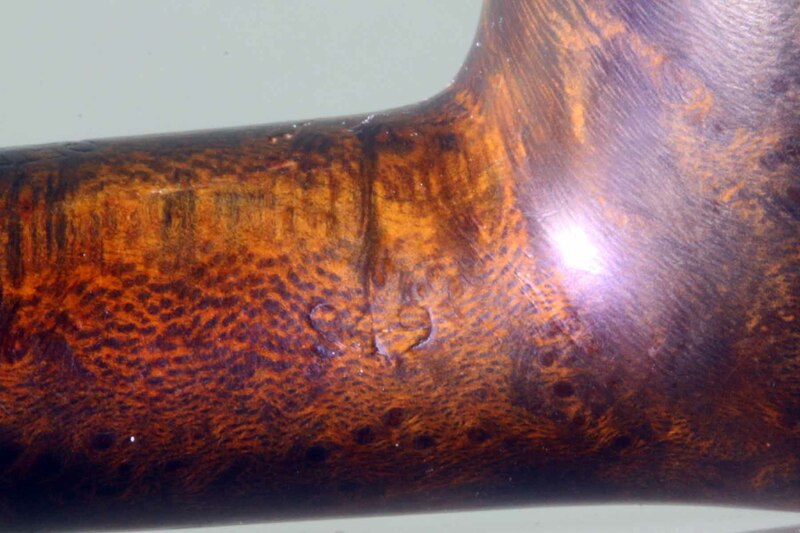 James’s pipe is an earlier-made example of the large pipe, which seems to have been mis-marked as the slightly-smaller oval shank 977. The apple in the Yale page is part of the same problem: it is really shape 969 (per the 1937 catalog). I love how these old catalogs would once in a while throw the pipeman a bone in the way of a 1 to 1 reproduction. George Yale did a good job sizing the image of the pipe—as you can see, they match up almost perfectly. At present, Peterson make a series of billiards that could almost be matryoshka (nesting) dolls: you can start with the incredible 107 and nest inside it the incrementally smaller X105, 105 and 101. I wish they’d bring a little more diversity to their straight billiards and back the old diamond-shanked 109 and something like this oval-shank 949, or even the old 1049, a square-shank straight billiard. The cake was simply amazing. Reaming actually brought the weight of the pipe down by 3.5 gr and cleared out a very clean and tidy chamber with the classic Peterson dimensions of 19.6mm x 40.00. It also made itself very aware to my nose that this pipe, so carefully and fastidiously smoked (notice it was never clenched between the teeth) was also never reamed. And it smelled it. So, in it went for a good long soak in the isopropyl bath—48 hrs. When it came out, the stain was lightened, as I expected, but nothing a very light wash of medium-brown won’t cure. The bath also brought home the damage done to the rim’s outer and inner edges. This time I applied 100 grit first, from a standing position to give me more torque, and the work went very quickly through the 150, 220 and 400 grits. With the outer edge crisp, next came the decision of what to do with the inner rim. Underneath all that carbon, someone had been fairly cavalier with a knife, giving the chamber an out-of-round effect caused by gashes on two sides. A Grade 3 would never have an inner bevel. Looking at the Peterson billiards in my rotation, only my Supreme has one, as a matter of fact. In the end, the desire to make the pipe look as fine as possible won, and I gave it as slight a bevel as possible, because the walls aren’t as thick as some Pete bowls. I used the 220 grit to “saw” the 45-degree angle into the chamber, then “wisped” 400 grit sideways around the inner rim to give the edge a uniform width. There were a few “meteor showers” and “falling stars” on the bowl, which I took out with steam heat (heated flat-heat screwdriver pressed against wet t-shirting onto bowl). Then I sanded the bowl at 400, being careful to tape over all the bowl stamps first. Some of the finish color was removed with the 400 and 600 grit, not surprising considering the pipe dates to at least 1937. Afterwards I made a weak black-stain wash and coated the rim several times. Old Peterson stamps can be weak and indistinct. This time, I gave all three stamp areas (949, IRISH FREE STATE and Peterson’s over Dublin 3) a few coats of the weak black-stain wash, to bring out the visibility of the stamps. This helped a little, but not as much as I’d hoped. I’d like to know from someone “more senior”: what I could do to make them stand out more? Then I made, then made the stain a little stronger and coated the entire bowl. 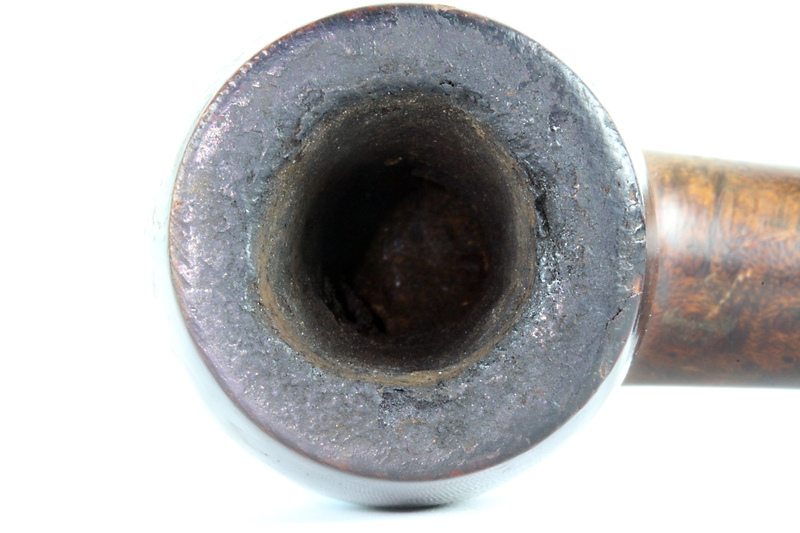 As you can see in the photo, a black wash doesn’t stain the pipe black, but brings up the original black undercoating applied to bring out the grain. After staining, I applied Simichrome liquid silver polish to the nickel mount, let it set for a while, then rubbed it off. It’s worth noting that the nickel band is not only silver-soldered by hand, but has been turned down at both edges of the band to meet the briar and the stem. Very classy. The nickel-mark stamps are also quite well articulated and look like they’ve never suffered under the buffing wheel of an over-zealous tobacconist. The stem is another unusual one in my experience. It doesn’t seem to have oxidized over the years, yet everything about it convinces me it is original: it was filthy on the inside, matching the massive lava and carbon; it has an extended tenon (as you’d expect); it has very light teeth chatter marks, but not on the button—further up the stem. After an extensive internal cleaning and giving the button a few passes with a soft-flame lighter to raise the light chatter, I felt I could go straight to the buffing compounds: tripoli, rouge, and white diamond, with Obsidian oil in between. I finished the bowl with a light white diamond buffing followed by a light coat of carnauba. Then, as insurance for James’s first smoke in an 81-year old pipe, I treated the bowl to Charles Lemon’s maple syrup / activated charcoal bowl lining. I’m really pleased with this one—it looks like new/old stock to me—and I hope it finds its way into James’s regular rotation. Outside Diameter: 1.44 in / 36.58 mm. I have two Shamrocks, made in Ireland, with nickel bands. They came from Amerika years ago. One is a 80s with no fills and in fact a straight grain,hardly smoked when I got it. The other is a billiard, smaller bowl than a x105, well shaped, not much grain and 13 fills. I smoked it first time yesterday, 5-6 times and again this morning. What a good pipe ! 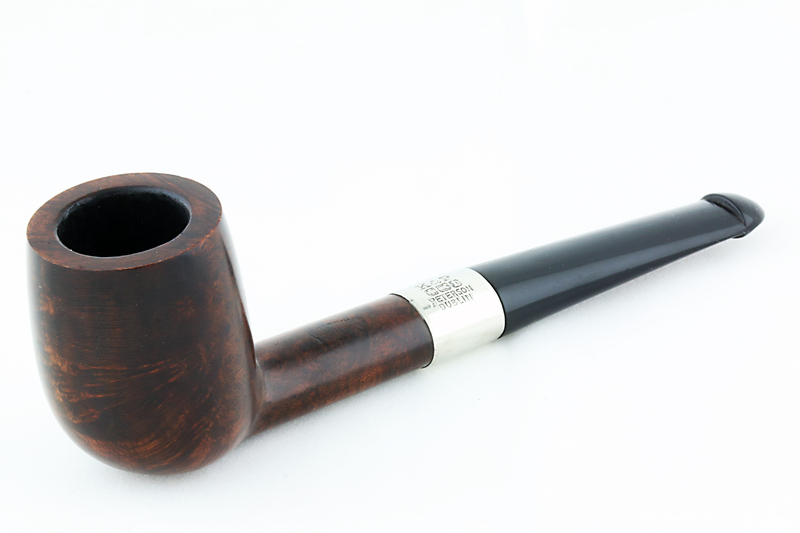 Irish Free State is my favourite pre Republic era for collecting, and my favourite Peterson shape happens to be from the 900 series, the short 980 is one of the best smokers I have. It looks like a 2/3 length version of the 150 and aesthetically it is just right for me, I wish Peterson would reissue this shape and due to the surging popularity of nose warmers I think it would be well received. Marc, isn’t this the meer that you sent me a picture of? If so, is that 980 shape actually stamped on the bowl? I’d also like to know the dimensions at some point. No, that meer is actually considerably smaller than the 980 and 20-35 years earlier (1901). I’ll get some measurements for you in the next week or so. 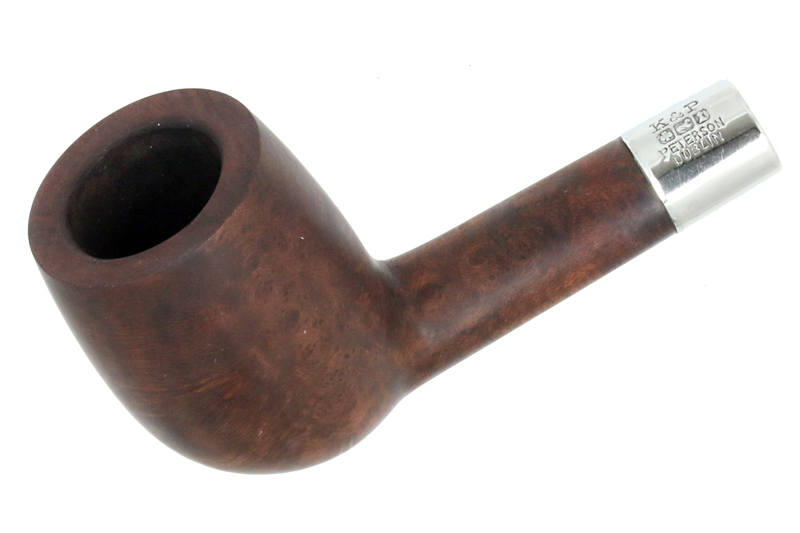 The 980 is a short straight briar bulldog and is really an incredible little pipe. Thanks for the latest report! Nice restoration and wonderful article on this series of Petersons. I have several 949 briars, a Patent3, DeLuxe with Rose Gold Band and a Kapet. All are pre-Republic pieces and wonderful smokers. It’s such a pleasure to read about the old styles and finishes. This is what make Peterson such a great Company. So looking forward to all of the historical information in the upcoming book. De Luxe w/ rose gold??! Andy, that’s Pete Heaven, for sure. Maybe I should put this shape down on Laudisi’s “Consider This Shape” list, as I see Linwood likes it, too. YES, do so please – just ask that it be a longer overall shape – elegantly ~6.25″ +. Gosh, I didn’t know there was such a list. Let’s see, start with the 949, perhaps same dimensions in a round shank pipe also. But for sure, an ODA size straight with taper stem 493 – PLEASE! oh, now you’ve got me started……. Now THIS is an elegant shape! The proportions are, imo, perfect! Fabulous restoration Mark, I am jealous of your skills, and results! But now the maple syrup thing….well…..it’s probably better for the smoker than some of the egg whites/lactose stuff. Tut tut, Linwood. Try it before you balk. Charles Lemon’s recipe really works. When it’s dried, you can’t tell what it is–just looks like matte black activated charcoal powder, which many estate dealers smear inside the bowl with olive oil. But it has a very fresh taste–really, a “no-taste” at all. Just clean and tobacco. Wish I was going to be at the Manchester Moose Lodge on Saturday the 29th and on that factory tour. I hear you’ve been working overtime on the CORPS show. Very exciting! We wish that you were coming to the M.M.L on the 29th (and you should make the Sutliff Tobacco tour, too). There are too few Petersons represented – when we KNOW that there are fabulous collections out there. Anthony Macaluso use to display his multi-faceted collection at our past shows – and wow what great Petes he has! Once again, Mark, another beautiful job ! I can’t express my gratitude enough. It WILL indeed be smoked regularly, and lovingly ! Well, the feeling’s mutual–it was great fun to learn about your pipe & to find that other Pete freeks like this shape as well. I have been reading your articles for only a short time. I cannot remember how I came across you but I’m jolly glad I did. Absolutely wonderful. The care and detail you reveal in both words and work are quite inspirational. I received in this morning’s post a Peterson Kapruf. 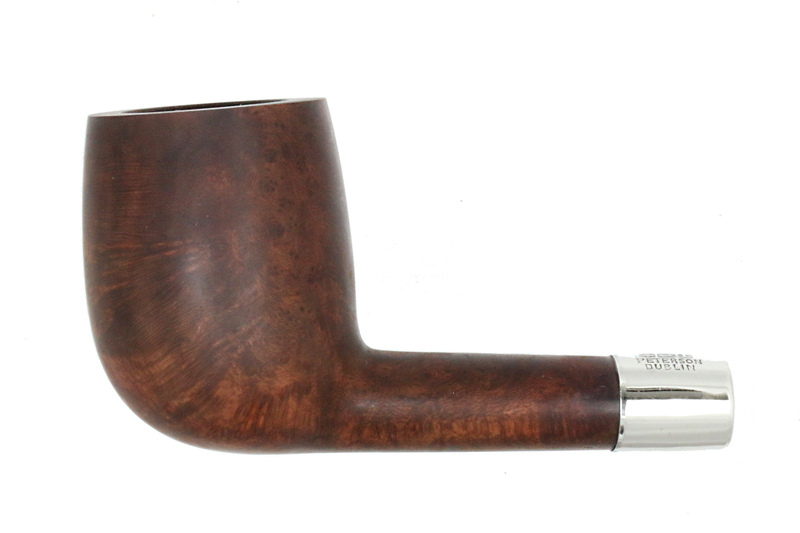 Sandblasted, straight billiard, No. 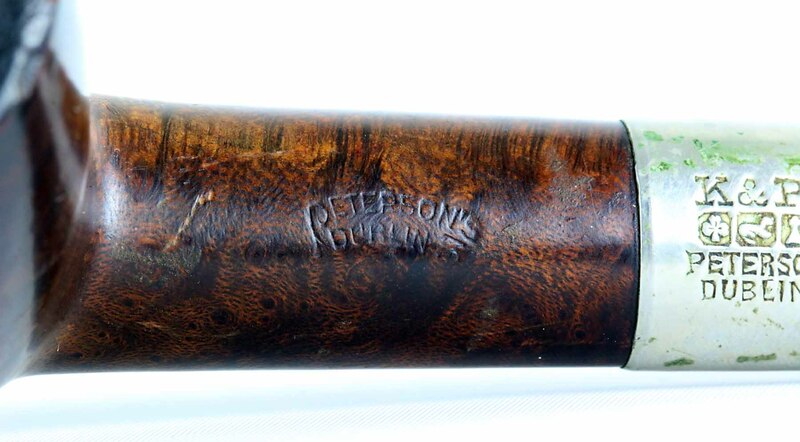 381, “Peterson’s Kapruf”, “Made in Republic of Ireland “. This was a complete surprise to receive, from a generous pipe friend (he also included a Jambo Meerschaum in the package). 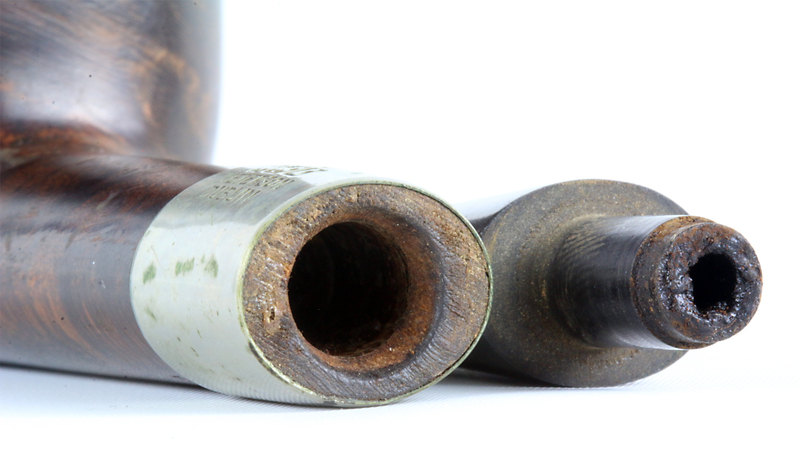 The pipe is a delight to look at, the outer walls well worn smooth with time by whoever has smoked it and my friend estimates it to be around forty years old. A new stem has been fitted, I think. Light in weight, it’s a perfect, classic shape, one, coincidentally, I’ve been recently looking for. Already had a bowl in it and it’s perfect, but a few more will settle me into it. Very much appreciate the site and look forward to following you. Thanks, Steven! Your 381 hasn’t been in the production catalog for quite awhile now. A lovely billiard. 1987 is the last time Peterson listed the Kapruf line in the catalog, although the last instance of shape 381 I can find dates to the 1965 catalog. You’ll be able to see that shape chart in the Peterson book we’re publishing through Briar Books Press–the book launch will be at the Chicagoland show in early May. A beautiful pipe anyone would be proud to add to their rack, Mark. Lovely job on the restoration! And I’m glad to see you’re having good results with the maple syrup/charcoal bowl lining – in three years of writing the DadsPipes blog, that post has consistently been in the top five for visits – a stat that always amazes me. I really like the looks of this old Pete. Mark did a great job on the restore and the write up. Cannot wait to read the book he is working on! Stunning job on the pipe – and great tip regarding the black wash. I’ll be rooting around my spares box for suitable candidates. Mark, I do have a query regarding an old Pete: I have a 1940s Deluxe without stem. It has no shape number but it appears to be an 11, circular Made in England COM. I want to restore it as close to the original as possible. However, I’m stuck on the stem and the folks at Pipe Mag have pointed me in your direction. I found a 1940s catalogue which showed both the 11s and 11b. Was it simply a matter of ordering your preferred stem, or were 11s and 11b separate pipes in their own right? Basically, for that time period, would a tapered stem be more appropriate than a saddle, or was it simply a matter of preference? Thanks Mark. Thanks, Geoff. You can take a look at the difference in the Peterson 1940 catalog for yourself. Copy and paste this PPN:https://petersonpipenotes.wordpress.com/2016/12/25/the-1940-peterson-pipe-catalog/ . Open the PDF (or download it) and go to page 3. The top 2 pipes are the 11s and 11b. By 1945, the tapered (b) stems were going out of fashion, but hung around in very small numbers until around 1958. The b will be a little heavier, of course, but I have Systems both ways, and enjoy both. As to your question, “were they separate pipes in their own right,” I don’t have a definitive answer yet, because I while I DO have a 4B, meaning the shank is stamped 4B, I don’t have enough evidence to generalize whether it was common practice at the factory to bowl-stamp the different mouthpiece configurations. It is a shifting-sand sort of question, since factory practice would vary over the years. In the beginning, bowl shape numbers were simply penciled inside the chamber! The elusive 11B is THE SYSTEM pipe I’ve wanted to find. 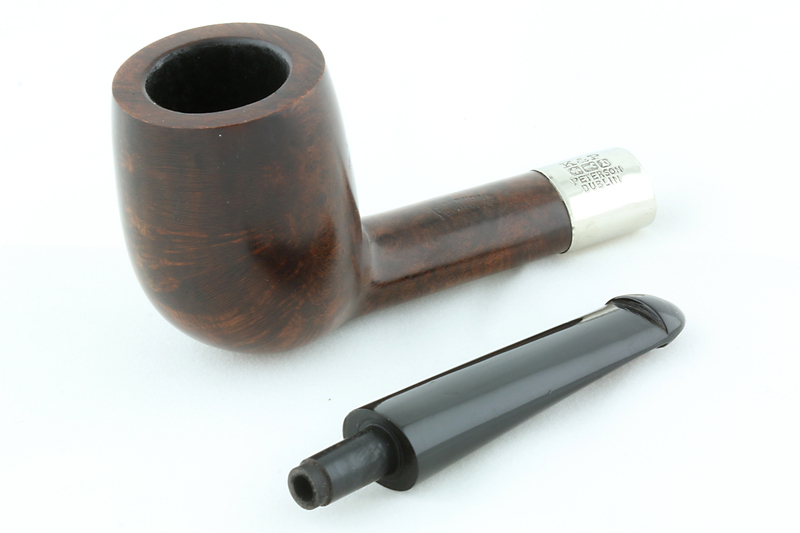 My gosh, I wish Peterson would make such again – I really like the heavier tapered stem. Linwood, actually there have been a few in the past several months. David had one at Bolitto Pipe, and Smokingpipes had one (I think). You can see David’s, as well as several 9Bs and a few other B De Luxe Systems, at https://www.bollitopipe.it/peterson-standard-system-deluxe-natural-c-10_49_199.html . In June I got a 9s with b stem from Harrison & Simonds,UK. I was i a hurry when i saw it. Not long ago another UK seller had a 20s with b stem… well, I have three 20s unsmoked and two smoked. That must be enough.